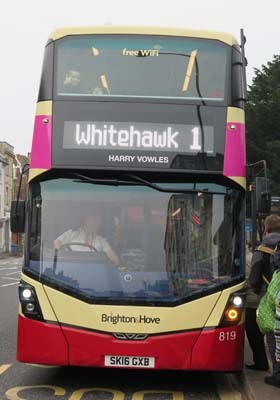 Connections with Brighton and Hove : Blind Harry Vowles was a busker who became well known in Brighton in the Victorian era. He was born Henry Richard Vowles, in 1861 in Lambeth, London. He lost his sight at about three weeks old and was put into a blind home to live. Vowles was taught to play a number of musical instruments, but his main asset was his fine tenor voice. He moved to Brighton in 1882. To earn his living he sang in the big houses around Brighton, and entertained in local hotels like The Ship Vowles was a regular performer in the music halls and had a pitch on the Brighton and Hove border, by the Peace statue, He married Alice Vaughan in 1885 at St Nicholas' Church and they had nine children. They lived in Upper Russell Street. During the First World War, he spent a lot of time entertaining troops stationed in the Brighton area. He died in 1919 when the Spanish influenza virus swept the country. The Blind Busker pub in Church Road, Hove is thought to have been named after him. 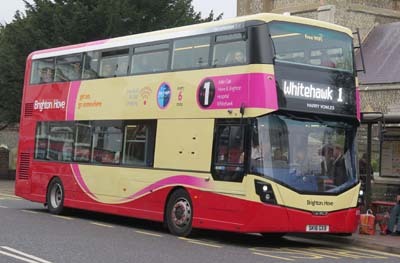 819 Mercedes Streetdeck on Route 1 - carried name since December 2016.